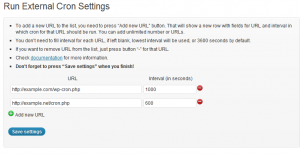 Run External Crons is a WordPress plugin (download) that enables using WordPress as a cron system that would hit external URLs (ie. any URL) on a scheduled basis. 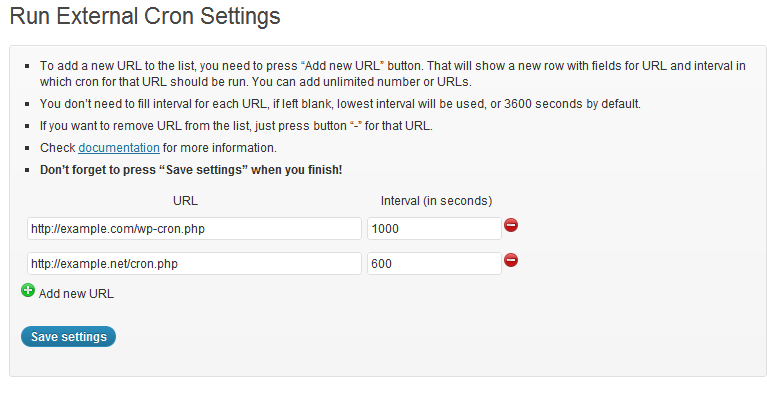 User can submit URL and interval in which that URL should be opened by WordPress. If you are translator, you can translate it to your language and send translations. Currently, Serbian translation is available. Run External Crons is released under the terms of GNU General Public License. It is completely free so if you find it useful you can give something back to author. Your help could be done by giving donation, translating plugin to your language, sending bugs and suggestions, promoting plugin in blogs, forums social networks, and other websites. This looks amazing for sites hosted on WP Engine that I believe lack Cron. Thank you so much for solving this issue for me! I installed your cron plugin, thank you for making it available. When I click on the save settings button, the cron php, runs immediately, instead of running after 10 minutes of the interval time I specify. Do you have an idea on why this is happening? This is expected behavior. Why is this causing problem to you? I just wanted to run on the specified interval, like once per week, or once per month. But not to run immediately. is that possible ? The way plugin works is that when you change settings, it runs cron first time, and after that it runs on specified interval. I am trying to execute a cronjob every hour that will trigger wptwincompanion.php file (automatic backup of website). If that file is accessible via URL (like http://example.com/wptwincompanion.php), you need to use that URL. So you need to figure out what is a URL of that file.